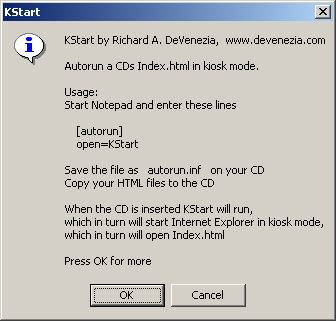 Autoplay index.html in Kiosk mode when a CD is inserted. KStart will also run any other type of file. autorun.inf and index.html are files on a CD. If the prefered browser is not found, then Internet Explorer will be used. If IE is not installed then the default handler for HTML files will be used. 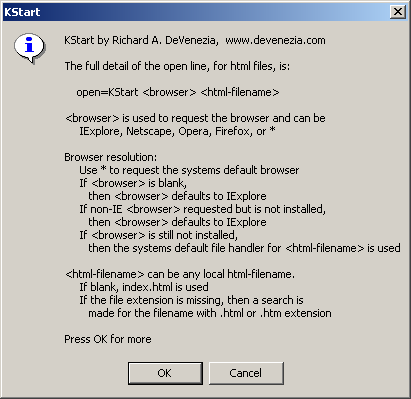 IE and Opera browsers will be run using their -k option. The other browsers do not support -k, these will be run at maximized size. If the filename is not an html file then it will be opened with its default handler. Thus you can autorun things like mp3, xls, ppt or txt. This page was last updated 11 July 2005.